STX's Jeff Mason and Matt Jantomaso (right) with Caryann Concilio and Amanda Intoccia, owners of Bamboo Salon in Staten Island, New York, during STX's 5 Principles of Success class. 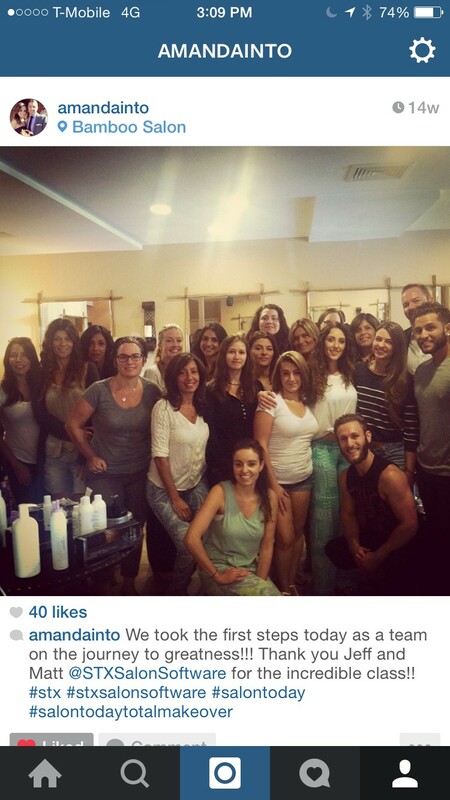 As Salon Today’s first Total Salon Makeover winner, Bamboo Salon in Staten Island, New York, recently took its first steps to grow its business to the next level. Meeting with representatives from Keratin Complex, STX and Takara Belmont, owners Caryann Concilio and Amanda Intoccia made plans to accept the competition’s prizes, including a full retail collection and fully stocked backbar from Keratin Complex, a complete salon management system including hardware and software from STX, and furniture and interior design consulting services from Takara Belmont. STX’s Jeff Mason spent a day with the Bamboo team, walking him through his 5 Principles of Success, including getting the chair full, communicating effectively, technical skills, interactive styling (retailing) and rebooking and how and when to raise prices. Simultaneously, STX’s Matt Jantomaso worked with the salon’s front desk team, getting them accustomed to the new management system, which will go in with the new décor. THE APPLICATION PROCESS FOR THE 2015 COMPETITION IS OPEN! And this year, the prize package is even bigger. To enter, salon owners/managers are asked to submit a short essay on how and why they'd like to grow their business to the next level and submit some images of their existing salon design. To learn more and enter, click here. Full retail collection, fully stocked backbar, full Color Therapy product portfolio, and a comprehensive marketing and education package from Keratin Complex. A complete salon management system, including hardware and software, from STX. A new front desk area or another aren in your salon along with interior design consulting services from Takara Belmont. Strategies will complete an assessment of the business, provide a 'makeover plan,' work with the owner and team to implement changes and coach them to measurable success.